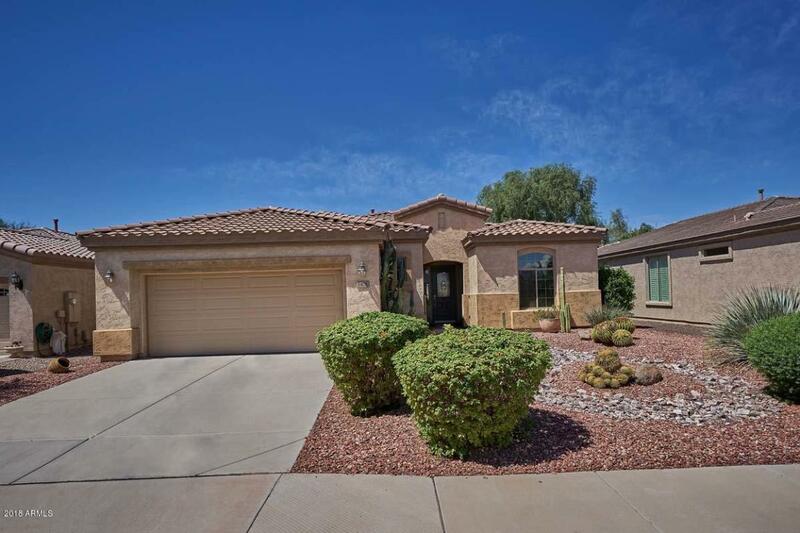 LOVELY HOME IN TRILOGY AT POWER RANCH W/PRIVATE PEBBLETEC POOL WITH WATER FEATURE. YOU'LL LOVE THE EASY CARE DESERT LANDSCAPE FRONT & BACK. THIS GREAT ROOM PLAN HAS SO MUCH TO OFFER W/FAB KIT & WRAPAROUND BREAKFAST BAR/QUARTZ SILESTONE COUNTERS & BACKSPLASH/UPGRADED CABS/LIGHTING/20'' TILE T/O W/MEDALLION AT ENTRY/HUGE COV PATIO + RAISED DECK & BLTIN SS BBQ. TILE COUNTERS IN BATHS & ENORMOUS TILED SHOWER IN MBR + RAISED BATHROOM COUNTERS/SPLIT FLOORPLAN PLUS DEN. OVERSIZED 2-CAR GARAGE HAS ROOM FOR THAT GOLF CART! SURROUND SOUND IN GREAT ROOM, EXTERIOR OUTLETS FOR HOLIDAY LIGHTING. AND TRILOGY HAS ALL THE AMENITIES YOU ARE LOOKING FOR FROM FABULOUS CLUBHOUSE TO TONS OF ACTIVITIES. LIVE THE TRILOGY LIFE! !